All transactions are safe and secure with a reliable history in online purchasing behind each of our associates. 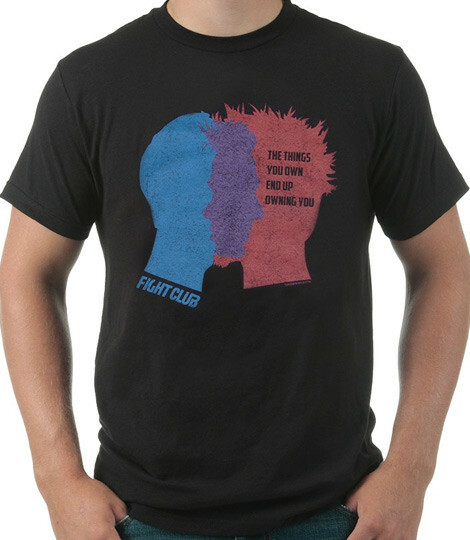 Buy the Fight Club Owning You t-shirt to own Fight Club clothing and merchandise. Let this image of Tyler and his better half remind you not to break the first rule of Fight Club. This Owning You design creatively morphs each character together. Just make sure that you don't break the first rule when someone tells you they love it. These unique Fight Club t-shirts offer the perfect balance of both personalities. Pair it with an "I'm breaking the first rule of Fight Club" t-shirt. In addition to the Fight Club Owning You tee above, browse the Fight Club Clothing Gallery for more apparel like men's and women's clothes, kids shirts or hoodies.